Hallmark Channel has announced that the network has acquired the rights to the popular 1990s sitcom, Home Improvement from Disney-ABC Domestic Television. The off-network comedy series will drive the network's sitcom block with all 203 episodes from the series (seasons one through eight) joining the schedule in September 2013. The classic family comedy joins reruns of Emmy nominated drama, The Good Wife, which begins airing in January 2014, and reruns of award-winning comedy, The Middle, airing March 2014, as the network accelerates its strategy to assemble a "dream team" of programs comprised of acquired hits and original scripted fare. Currently, Home Improvement airs on both TV Land and TBS. However, TV Land's rights to the series is expiring at the end of August and it looks like Hallmark will be picking their rights up. TV Land is airing the sitcom in the 5am hour right now. TBS will also be losing the rights to the series. 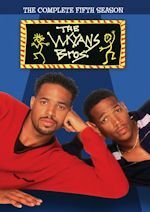 Right now they only air the sitcom on Sunday mornings at 7am and after April 28 it is missing from the schedule completely (replaced by an extra Friends rerun). 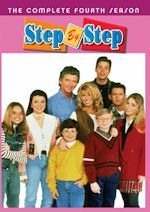 Both Nick at Nite/TV Land and TBS signed a six-year deal for the sitcom back in 2007 (announced in 2004) and that is expiring at the end of this August, 2013. It'll be interesting to see if Hallmark Channel will have exclusive rights or if another network will also pick it up to share with Hallmark. Or maybe either TV Land or TBS will renew it, but that seems unlikely, especially TBS. We'll certainly keep you in the loop. 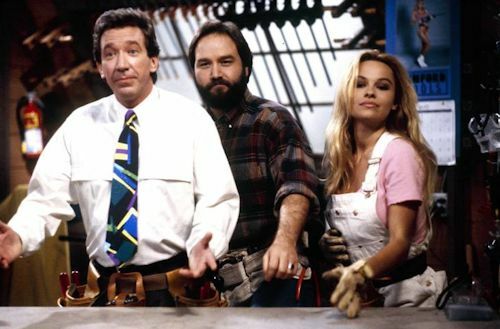 Based on the stand-up comedy of Tim Allen, Home Improvement made its network debut on ABC in September 1991 and was one of the highest-rated sitcoms for almost the entire decade. 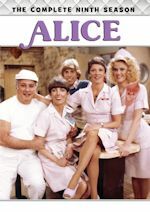 This popular family comedy starred Tim Allen, Patricia Richardson, Earl Hindman, Jonathan Taylor Thomas, Zachery Ty Bryan, Taran Noah Smith, Richard Karn and Debbe Dunning as the "Tool Time" Girl. Pamela Anderson (pictured) had a recurring role in the first two seasons as the "Tool Time" Girl. The series was a family viewing favorite and appealed to all age groups. The universal themes of family, parenting, the battle of the sexes - and of course, man's need for "more power" - come to play throughout the episodes of Home Improvement. The show's writing and performances have allowed it to address serious issues in a humorous way, from mid-life crises and career concerns, to health challenges and the ups and downs of adolescent relationships. 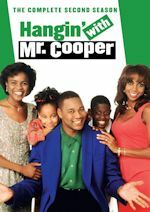 The final episode aired on May 25, 1999 with a 90-minute finale, which was the fourth highest-rated comedy series finale of the 1990s, behind Cheers, The Cosby Show, and Seinfeld. The show was honored with an abundance of awards, including Emmy Awards, Golden Globe Awards, People's Choice Awards, Nickelodeon Awards and Kid's Choice Awards. America's favorite tool-man, Tim Allen, won the People's Choice Award for "Favorite Actor in a Television Comedy Series" for eight consecutive years. Stay with us in the coming months for more details on the sitcom joining Hallmark Channel, including of course premiere date and what times it will air. ABC Family announced the network has green-lit a third season of its hit original comedy series, Baby Daddy. The order came just as production wrapped on the second season of the series, which premieres on ABC Family, Wednesday, May 29 at 8:30pm ET/PT, after an all-new episode of comedy Melissa & Joey, as we previously announced. The sitcom was an immediate success when it launched last summer and based on the creative strength they saw during production on Season Two, and how the episodes, storylines and characters are developing, they decided to double down on this hit show and keep it in production for additional episodes. Baby Daddy premiered to ratings success in its first season as the #1 new cable comedy of Summer 2012 in key female demos, winning its time period across ABC Family's core Adult 18-34, Adult 18-49 and Millennial demos. Together with Melissa & Joey (its lead-in), Baby Daddy has made ABC Family summer's cable comedy destination on Wednesday nights. Before we get to season three, we still have season two launching this summer. ABC Family also announced that it has cast Leslie Jordan (The Help, Will & Grace) to guest star on the original comedy series. Jordan will guest star in the holiday episode as a world-weary elf from the local mall who becomes Ben (Jean-Luc Bilodeau) and Danny's (Derek Theler) boss when they get jobs at Santa's Workshop. He gives them a hard time as they desperately search to find Emma the perfect gift for Christmas. The episode will air later this year (closer to the holiday season). The series stars Jean-Luc Bilodeau, Derek Theler, Tahj Mowry, with Melissa Peterman and Chelsea Kane. The multi-camera comedy shoots in front of a live studio audience in Los Angeles.